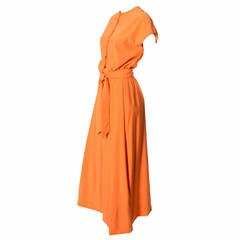 Stunning tangerine orange evening gown by Oscar de la Renta from his 2008 Cruise line. This dress has a fitted "boned" buster inside, creating a beautiful supportive structure for this flowy, very elegant dress! The dress has one asymmetrical strap that crosses over in front and a side zipper closure that has a panel of pleats cascading down the side. At the mid level of the skirt portion of the dress, there is a button and a loop that act as a small bustle. This is a sensational vintage dress and any variations in color, specifically the darker hem area, are only due to our lighting and do not reflect the color of the dress, which is perfectly uniform in color. This dress is in excellent condition. We are showing this beautiful evening gown on the runway in Oscar de la Renta's 2008 Cruise Wear collection. Marked as a size 8, and measures like a US women's size 8. Please use the measurements below to ensure the perfect fit. BUST: 38" WAIST: 28" LENGTH: 52"
Chiffon gown with radzimir bodice and vest.